Clean & Buff & Shine (CBS) – This method includes a thorough cleaning of the floor that starts with dry soil removal. That is followed by wet mopping with extra attention given to the edges and corners. Then the floor is buffed with a high-speed burnishing machine to bring out a high gloss shine. Regularly performing this service will extend the strip & refinish time cycle. Scrub & Recoat (S&R) – This method includes everything in the CBS procedure above with the addition of Scrubbing the floor with a heavy duty detergent. The floor is then dust mopped and the application of one or two coats of high solids floor finish. You won’t believe the shine! Strip, Seal Wax (SSW) – The SSW procedure is the major refinishing procedure that removes all finish from the tile and allows the finish coats to be built back up. This method removes all imperfections in the finish and provides a high gloss shine. We use only the best tools, equipment and chemicals on the market. We give you the best value available. 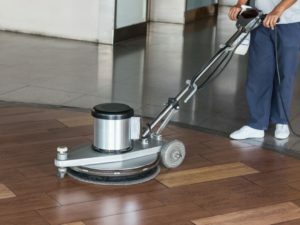 Our pricing is based on the total square feet of the area being cleaned and also takes into consideration the condition of the floor as that is the biggest factor in the time it will take to clean. Maintenance Plans will offer the best pricing as the floor will never get outside of a clean the standard you choose. Regardless of the VCT cleaning method we utilize, we employ several unique procedures that will ensure each client will Love Our Service! We will carefully move furnishings and utilize other safety equipment and precautions to help prevent damage to your home or business during the cleaning process.